A couple weeks ago, I shared 2 of my favorite non-lettuce, veggie-loaded salads, both of which are on regular rotation in our kitchen as lunches and side dishes. After publishing that post, I opened my photos on my computer to start editing photos for future posts, and I came across the pictures I took of a “Christmasy” Brussels Sprouts Salad I made for my extended family’s big Christmas lunch (along with smoked brisket, baked beans, cornbread, mac and cheese, fruit, applesauce, etc.) It was delicious!! Of course, I’ve made this type of salad many times before, but for our Christmas meal, I experimented with a few new ingredients in attempts to make it extra festive with lots of red and green. The results were a fantastic combination of ingredients — the main “star of the show” being…. Seriously, even if you hate Brussels Sprouts, I have a feeling you’ll be pleasantly surprised with how tasty this salad is — I know I was personally shocked, and I eat and enjoy roasted Brussels Sprouts almost every day. The flavor of the raw sprouts is very mild, the crunch is fantastic, and the mix of different flavors and textures (sweet, salty, savory, crunchy, chewy) is amazing! The dressing has just the right tang (in my opinion), and best of all, it’s an easy recipe to mix up in advance — even a day or so before you plan to eat it. 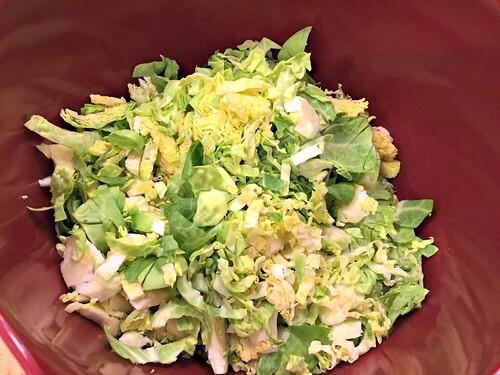 I initially told our Christmas guests it was a type of “coleslaw” (technically Brussels Sprouts and cabbage are both in the cruciferous family) and after they all seemed to approve, I let it “slip” that Brussels Sprouts were the main ingredient! Most people seemed surprised… but my big bowl of “coleslaw” only had a couple spoonfuls left after everyone had gone up for seconds. I think they liked it! 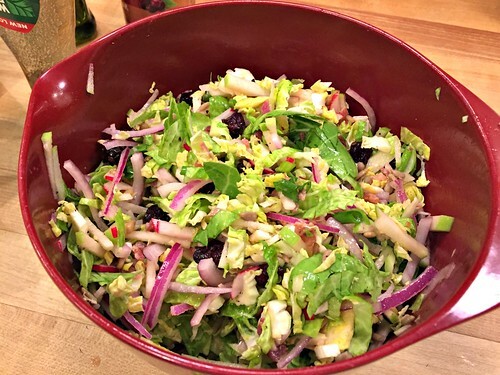 If you’re looking for another super easy, make-ahead salad or side dish, pick up some Brussels Sprouts the next time you’re at the store (they are often on sale this time of year) and give my recipe a try! NOTE: all ingredients are “optional” — seriously, you can add in (or omit) whatever veggies, dried fruits, nuts, seeds, you like. As you read above, I added all red and green foods as I was making the pictured salad for a Christmas party! ANOTHER NOTE: technically, a true “vinaigrette” uses THREE times the amount of oil as vinegar — however, that’s a lot of extra fat and calories, so I always cut back on the oil and increase the vinegar. 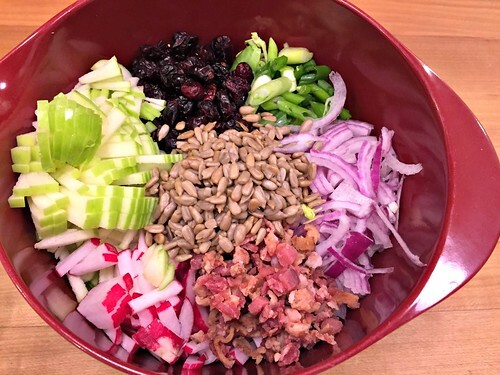 I really like a stronger vinegar taste, and in my opinion, this salad tastes fantastic as written! However, feel free to adjust the oil/vinegar ratio as your taste buds prefer. 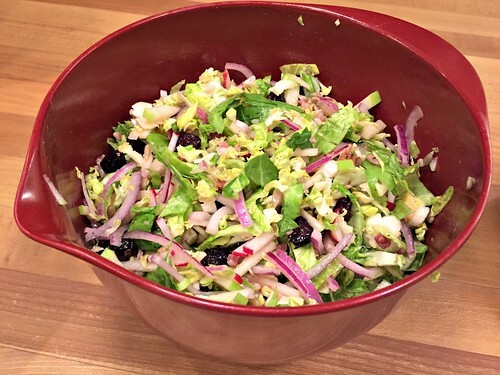 In a medium size mixing bowl, combine shredded Brussels Sprouts, chopped broccoli, sliced onions, diced radishes, apples, seeds, nuts, bacon, dried fruit, and any other ingredients you’d like to add. 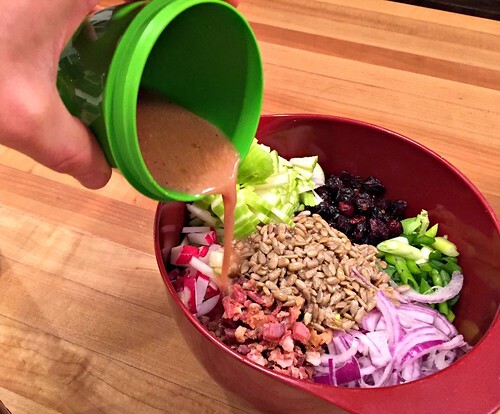 In a smaller container with a tight fitting lid (or in a blender) combine all dressing ingredients. Shake or blend to combine. 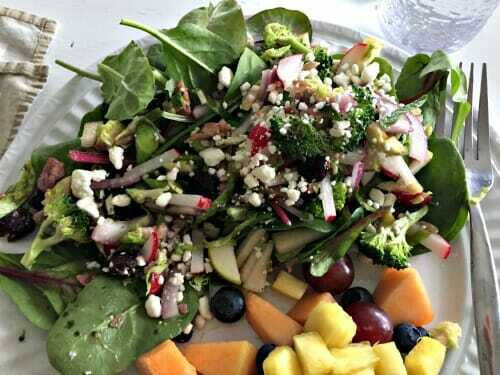 Taste dressing by dipping a piece of broccoli in. Add more seasoning to your taste. Cover and refrigerate for at least an hour before serving (I often make this in the morning if we’re eating it for dinner — or sometimes even the day before). We regularly enjoy this “coleslaw-type salad” as a side dish to a variety of meats (it’s amazing with burgers, pulled pork, or beef brisket!). However, I also enjoy it as a “topping” to a bed of spinach or salad greens. If you think about it, this salad is essentially composed of a variety of salad toppings WITH the dressing already included! I just scoop a few spoonfuls on top of whatever greens I have in the house, add a sprinkle of Feta or fresh Parmesan, and maybe another drizzle of vinaigrette and I have a DELICIOUS lunch salad without needing to chop anything extra! You’d never know you were eating a full pound of raw Brussels Sprouts! I make this non-lettuce salad 2-3 times a month and Dave and I enjoy the “leftovers” for a few days in a row — mixing up how we eat them each time. It’s extremely satisfying with all the yummy crunchy ingredients, it’s more exciting than eating plain raw veggies, and it’s quite nutritious (especially with the homemade vinaigrette). Add this to your salad rotation this winter — or bring it to your next pot-luck. Either way, try it out! You might not even realize how much you like Brussels Sprouts! What is your favorite way to enjoy Brussels Sprouts? 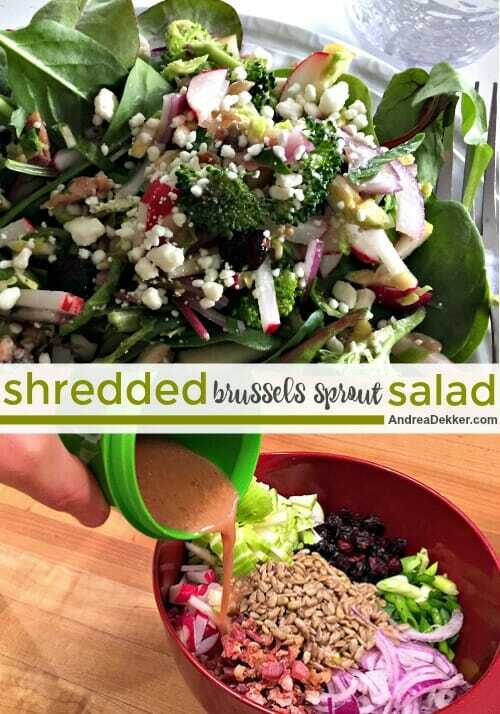 Andrea, how do you shred the brussel sprouts? I’m imagining using a typical shredder but those brussel sprout pieces are sometimes small and would be time consuming to shred each one. I just chop them thinly with a knife! It really doesn’t take much time at all. Oh my gosh. I made this salad last night and it is really amazing! I am having the leftovers for lunch today and it is even better the next day! My husband only likes salad with lettuce, cucumbers and cheese with ranch dressing, but he devoured this salad and said it’s one of the best he has had. This salad will be made weekly at our house! 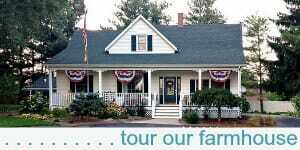 Thanks so much so sharing! oh yay — this makes me SO happy to read!!! I’m thrilled you (and your hubby) loved this “salad”!! 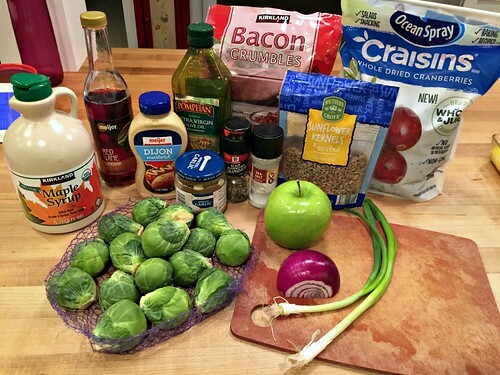 Oh, I’m one of those people who actually hate Brussels sprouts, sigh…. This honestly tastes like shredded cabbage in coleslaw — so if you like coleslaw, you should like this! Also, it might be worth mentioning that cooked/roasted Brussels sprouts really shouldn’t be “stinky” — that might mean they were “bad” and maybe THAT’S why you didn’t like time! And finally, I totally understand your desire to like a food you currently don’t. I have this with olives and pickles (Dave and I can not stand them and our kids devour them.) I force myself to eat an olive every so often, I’ve given up on pickles for now! Did you mean they SHOULD be “stinky” or SHOULDN’T? oh good grief — yes, they should NOT be stinky! I’ll go back and edit that comment to remove confusion! sigh! You are the 3rd or 4th person to recommend the Chopped Kale Salad kids at Aldi in the last 2 weeks — Looks like I need to buy a couple this week! I completely agree about the ratio of fat to oil. I always use equal amounts of both because, otherwise, the dressing just tastes way too oily. 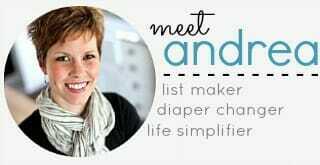 Do you shred them with a handheld shredder? Seems like it would take a long time and risk cutting your fingers a lot since they are so small. 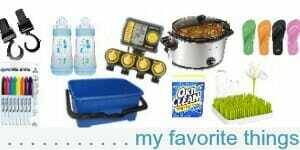 Or a food processor or mandolin? I just chop them by hand — I guess I’m used to chopping and slicing veggies every day so it doesn’t seem like much extra work for me. However, you could definitely try other methods as well — especially if you’re making a really big batch! This looks GREAT! Can’t wait to try this, thank you for sharing!